PlymouthAlert is an Emergency Notification System that serves Plymouth County, Iowa. PlymouthAlert will allow citizens to sign up for the types of alerts they would like to receive. Messages can be issued via landline or cell phone, text messaging and e-mail. Messages may contain photo, video and audio attachments to help subscribers better understand the situation at hand, or where to find additional information. NEW! 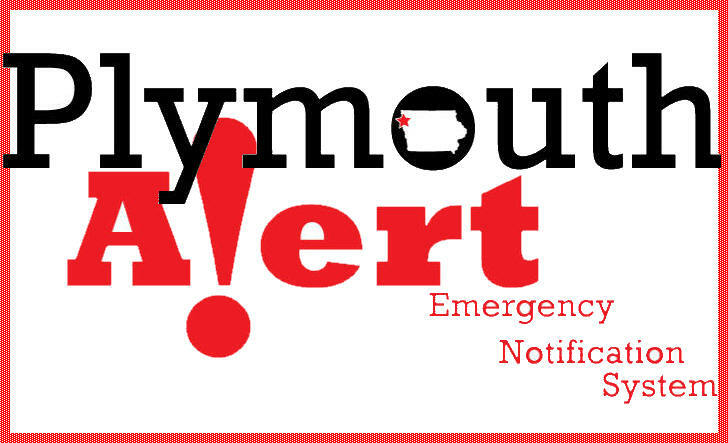 If you're visiting Plymouth County for a weekend or a short period of time, you can now do a quick sign-up to PlymouthAlert by simply texting Plymouth to 69310. This will sign you up to receive weather alerts by text message to your cell phone. When you leave to head home, just text STOP to 69310 to stop the messages. NOTE: This service is geared for tourists and those visiting for a short period of time. For our regular and seasonal residents, we recommend signing up for the full service that tailors weather alerts to your location and also offers more options. The PlymouthAlert Emergency Notification System is a part of the Alert Iowa statewide messaging system, provided free of charge to all Iowa counties by the Iowa Department of Homeland Security and Emergency Management. PlymouthAlert operates using the WENS network provided by Inspiron Logistics. PlymouthAlert is a system that allows a client to immediately send out text messages, voice calls, emails and pages in the event of an emergency or severe weather event. 2. How do I sign up or register for the PlymouthAlert? 4. How do I acquire additional information about PlymouthAlert, report a problem with the system, or get help with my registration? 5. I registered, but I don't seem to be receiving any notifications. What should I do? 6. Is there a charge for registering to receive messages through PlymouthAlert? NO, this is a free service provided by Plymouth County Emergency Management and the Iowa Homeland Security & Emergency Management Department. 7. I do not have Internet access, how can I sign up to get PlymouthAlert voice messages to my phones? 8. Does PlymouthAlert sell the phone numbers? Will registering for this system cause me to get more marketing calls or spam e-mails? 9. How do I unsubscribe? I do not want to receive notification messages anymore. 10. How do I update my information if my e-mail address, cell phone number, or other information has changed? 11. How do I switch a phone number from receiving a text message to receiving a voice call or vice versa? 12. How do I switch a phone number from being part of an "opt-in" group for which I previously registered? 13. Exactly what phones will be able to receive these voice notification calls? All voluntarily registered landline phones. 14. Can PlymouthAlert use the public database to have the Notification System call me on unimportant matters? 15. Will PlymouthAlert work if there is a power failure? 16. Will all cellular phone carriers deliver PlymouthAlert messages? Yes, the PlymouthAlert service provider works with all major cellular phone providers and is simply placing a call to your cell phone as would any other person. As with all cell phone calls, signal strength and other issues with your carrier could impact delivery of the message to your phone. Text messages, if selected as an option, will be sent to your carrier for delivery to your phone. Each carrier establishes its own protocols for delivery of text messages, so it is possible for text messages to be delayed. 17. Will I receive ads or Spam on my phone? No. Inspiron Logistics, the company behind PlymouthAlert does not tolerate spam text or e-mail messages. Inspiron Logistics maintains an anti-spam policy as part of the compliance to operate with Tier 1 provisioning with all of the major North American carriers. Tier 1 provisioning is only granted to top emergency officials and the PlymouthAlert system (Inspiron Logistics product name). This means that when the mobile networks are completely congested, the only messages allowed to go through are those with Tier 1 provisioning as a matter of priority. 18. I don't use text messages. Can I receive PlymouthAlert notifications by e-mail? 19. Can I register a phone number outside of the service area? Yes. For example, a business owner in Plymouth County may list their Plymouth County business address but list a home phone number in Clay County if they wish to be notified of a significant event that puts their business location at risk. Registration works the same when you list a phone number outside of Plymouth. 20. Can I register an address outside of the service area? 21. Why does PlymouthAlert send text messages? 22. After I received a voice message notification the system asked me to "Press 1 to acknowledge receipt". Do I have to press 1? 23. How can the system call everyone in the service area at once? 24. Will PlymouthAlert be periodically tested? Yes, tests are possible. PlymouthAlert will monitor the results of each notification issued and determine if there is a need to test the system to verify subscriptions to this system and to ensure the system is working properly. PlymouthAlert will avoid unnecessary tests, but will perform tests if determined that it is necessary for the integrity of the system.